Bellevue Hospital in New York City is nearly synonymous with mental illness, but it is so much more: One of the earliest medical facilities in the Colonies, it began as an almshouse, a place for the city’s undesirable, sick and feeble citizens. It is crucial to understand that Bellevue, first and foremost, is a hospital in the fullest sense of the word. It is not “just” a mental hospital, although its name has come to conjure that misapprehension, much as Bedlam provides the same response in Great Britain. 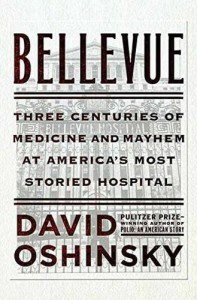 In Bellevue: Three Centuries of Medicine and Mayhem at America’s Most Storied Hospital, David Oshinsky (author of the Pulitzer Prize-winning Polio: An American Story) reveals how the rise of Bellevue reflected the medical practices of its times and, more importantly, how it led the way in care for the indigent. Oshinsky describes the state of medical practice from Colonial times (where one did not want to experience the care of a “doctor,” who may be nothing more than a quack) to the present and how those practices affected the staff at Bellevue. He situates Bellevue in its historical context, noting the origins of other medical facilities like Lenox Hill Hospital (a place in which doctors and patients conversed almost entirely in German) and Mount Sinai (which rose from Jews’ Hospital, a place which served only Jews except in the most exigent circumstances). Yet, Oshinsky writes, it is our “quintessential” public hospital and it continues to provide the poor and uninsured with quality care. “That’s what makes Bellevue so comforting and so disquieting,” he writes. “It stands, for all its troubles, as a vital safety net, a place of caring and a place of last resort.” In addition to its concentration on those who could not afford quality care, it was also the first US hospital to have a maternity ward, an emergency department, and a medical school on site. Its maternity ward evolved because of a connection made between doctors coming directly from the dissection of cadavers to delivering babies without washing their hands. That often resulted in puerperal fever and, nearly always, the death of the mother. Another factor in the rise of a separate maternity ward was the institution of female nurses. The experiences of Florence Nightingale during the Crimean War and Dorothea Dix during the Civil War were major factors in the rise of qualified nurses and an acceptance that cleanliness made a positive difference. In the Crimean War, for example, 4,774 died in battle while 16,323 died from illness and disease that could be traced to the appalling conditions of military hospitals. 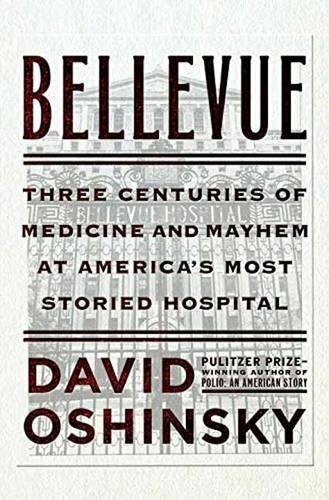 David Oshinsky has written an elegant account of how one hospital affected the changing world in which it has operated for more than 200 years. Its doctors have seen just about everything from everywhere, and more than one hundred languages can be translated at the facility. While it is no longer a leader in research, that role having been taken by Contract Research Organizations and large private hospitals, Bellevue remains true to its mission to provide first-rate primary care to the indigent and continues to be a premier teaching hospital. Oshinsky’s Bellevue is a stirring story of success in the face of tremendous odds.